This pic was done by TomNCatz (I don't know how to make direct links to people on IB. If you know how, let me know!). But this is really good instead of a toony flat look, he went and made this into a realism style picture. 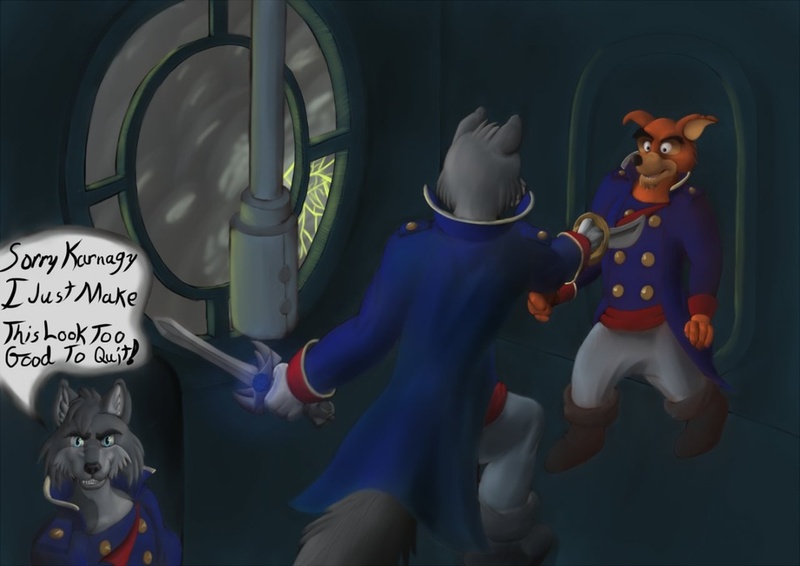 Anyways, on my travels in world I always been hearing about the Air Pirates led by a wolf named Don Karnage. I heard that Don and his air pirates were trying to find a mystical sword that nothing like any swords that world has ever seen. Legends state that the sword has a dark and terrible power, that if fallen to the wrong hands could doom the world. So, I went out to search for it and found it in a ancient ruin to the far north. As soon as I grabbed it, I began to felt something...That I should be the leader of the Air Pirates compared to that clumsy mutt, Don Karnage. So, I was able to sneak aboard when the Iron Vulture was being restocked when it was on the ground. I began searching for Don and looked into his room to see he was not there but I decided though Don was a clumsy leader, his wardrobe was not bad at all. So I put on his clothes and waited in a darken corner until the airship took off. I saw it began to storm outside while in the air so I made my way to the bridge and saw that moron talking to himself in the third person in the metal microphone that supposed to connect all over the ship. I made my move and confronted Don as I drawn out my sword. "Hold it right there Don! ", I said as I pointed my sword at him. "Who in the world are you? How did you get aboard my airship...And what are you doing in my clothes?! ", Don said as he tried to grab his sword. I looked as he is trying to make his move as I ran over shoving him out of the way as I picked up his sword as I grinned,"Shut up! Your time leading the Air Pirates is over!" "Wha?! ", Don said as he began to back to the only way out of the bridge. "Sorry Karnagy, I just make this look too good to quit! ", I grinned evilly while lightning shot out through the darken sky as I spoked in the microphone,"This is Axel Wolf, your new leader of the Air Pirates. As for your former leader...He will stay alive and follow my commands as the rest of you!" I looked at Don, both scared and shocked as I grinned,"I will have use for you...hehehe." Talespin and Don Karnage belongs to Disney. Axel Wolf belongs to me.